My dad and I read this book together because some parts weren’t appropriate for a kid my age ( 12 ). I enjoyed this book because the author tells a fascinating tale about a young girl and how she deals with adversity and betrayal. Laila is forced to flee the country when her father is murdered by her uncle. She runs away with her mother and brother to the U.S. Laila is busy blending in and making friends at her new school but her mother seems focused on the past. Laila knows that it was her uncle who killed her father. She looks through many newspaper articles for more information but one article stops her in her tracks. 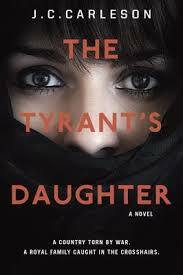 It calls her father a tyrant. The father that she knew and loved, the one who used to spin her in the air while she whooped with laughter, had somehow managed to inherit the title of a Tyrant. Laila knows that she has to do further snooping. Something just didn’t seem right when she heard her mother talking with her uncle on the phone. Her country had gone into civil unrest because her uncle is a dictator and her mother is talking to him? The man who murdered her husband? Will Laila figure out the plot of betrayal and treachery before it’s too late?